The Speedtest U.S. Fixed Broadband Performance Report by Ookla had some good news for American internet users struggling with slow connections. The analysis found that an expansion of gigabit internet connections has resulted in a 35.8 percent increase in download speed on average around the country. The U.S. is now the seventh-fastest country worldwide for downloads, though it still lags behind in uploads where it comes in at number 27. The analysis was carried out with 25 million unique devices that provided over 115 million tests in the second and third quarters of this year. 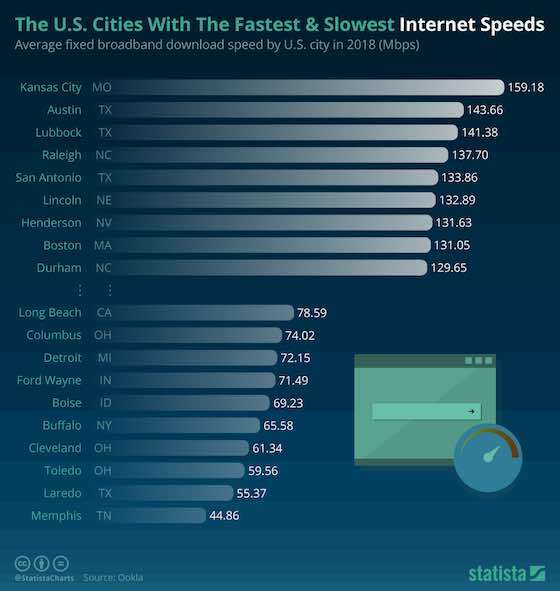 Kansas City boasts the fastest download speed in the country with an average fixed broadband download speed of 159.18 Mbps. Austin and Lubbox, both in Texas, come second and third with 143.66 and 141.38 Mbps respectively. Google Fiber is the fastest Internet service provider in three of the top five cities with the fastest speeds for downloading. The situation isn't as rosy elsewhere, however, with things still moving along at a snail's pace in Memphis. That city only has an average download speed of 44.86 Mbps by comparison. Internet & Social Media: "The Fastest & Slowest Internet Speeds "